The Good Seeds - Community Garden Group: Good Seeds Billboard! The Good Seeds have a Swap Meet billboard! 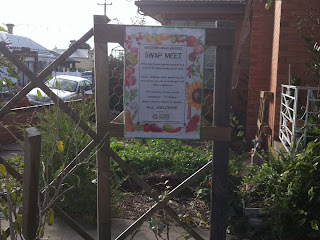 See if you can spot it on the way to the Swap Meet this Saturday on between 10-11.30 at Pilgrim St park in Seddon. Most annuals are started from seed sown in the garden. As for biennials, you may grow them just as you do annuals. You can buy many varieties of herb seed at your seed store, nursery or supermarket, but you cannot always be sure of what you are getting.